to further the study of the postal history, stamps and other philatelic material of Korea. to help members form collections relating to the philatelic material of Korea. to provide through its expertization committee expert opinion on philatelic material related to Korea. C. The Society is incorporated under the laws of the District of Columbia as a not-for-profit corporation as of August 08, 1968. A. Membership shall be open to all reputable collectors and dealers and other persons interested in the philately of Korea and interested in promoting the purposes of the Society. Regular, entitling the member to all rights and privilages of the Society. Sustaining and Contributing, entitling the member to all rights and privileges of the Society. Honorary, entitling the member to the rights and privileges of the Society set forth at the time of election to honorary membership, except the right to vote. A written application for membership, accompanied by the appropriate dues, shall be filed with the Secretary-Treasurer. Failure to pay annual dues, as reported by the Secretary-Treasurer, shall result in the lapse of membership which may be reinstated by payment of fees due the Society. A majority vote by the Board of Directors shall be required for expulsion from the Society for cause cited; however, an expelled member may be reinstated by unanimous vote of the Board of Directors if the cause for expulsion is deemed corrected. D. The annual membership fees shall be determined by the Board of Directors and announced in the February issue of Korean Philately. The annual fee shall be due on April first of each year. The Secretary-Treasurer shall report to the Board of Directors the name of any member who has not paid his fees by June first following the due date. Annual notice of fees due shall be mailed with the February issue of Korean Philately, on a suitable form; no other notice shall be sent. Dues for Sustaining, Contributing or other special classes of members shall be set by the Board of Directors. The names of Sustaining and Contributing members shall be published in Korean Philately, in appreciate of the assistance, unless otherwise requested. A. The Officers of the Society shall be President, Vice-President, Secretary-Treasurer, three Directors (at-large) and the Director of Publications. The Officers shall constitute the Board of Directors. a. A Nominating Committee, consisting of three members appointed by the President, shall submit a list of candidates for the offices open to election. Election shall be conducted by the Secretary-Treasurer. b. An “ad hoc” committee may be formed by five or more members for the purpose of nominating a member to any elected position; however, the nominating petition must be received by the Secretary-Treasurer in time to include the name of any such nominee on the official ballot. c. Any member may nominate, and vote for, a member to fill any elected position listed on the official ballot by writing the name of his nominee in the space provided on the official ballot. d. A nominee must agree in writing to serve the term of office for which he is nominated. Such an agreement may accompany any one ballot for a “write-in” nominee. Voting for officers shall be on the official ballot. a. The official ballot, as prepared by the Secretary-Treasurer shall be distributed with the February issue of Korean Philately, and shall contain the list of nominees submitted by the Nominating Committee or by an “ad hoc” committee and a blank space for “write-in” votes under the name of each office open for election. The ballot may be printed as part of the annual dues notice. b. Ballots shall be mailed to the Secretary-Treasurer, who shall be responsible for the count, and must be received no later than March 31. No ballot may be changed after it has been received for counting. c. As soon as the count has been completed, the Secretary-Treasurer shall notify the persons elected. The result of the election shall be published in the first issue of Korean Philately following the election; the form of the announcement shall be determined by the Secretary-Treasurer. The term of office shall be for three years, beginning April First of the Year of Election. Members of the Board of Directors shall be eligible for re-election. The Director of Publication shall be named by the elected members of the Board of Directors with the aid of other members of the Society. The Board of Directors shall be responsible for filling any vacancy on the Board, and shall elect the replacement member for the unexpired portion of the term declared vacant by a majority vote from a list of nominees supplied by the President. for the Board of Directors, to handle and conduct the business of the Society, to supervise the affairs and property of the Society as may be deemed necessary, to determine the annual membership fees, and to exercise all the powers of the Society. The fiscal year runs from April First through March Thirty-First of the following year. The Board of Directors shall recommend areas of special concern to the Society, including (but not limited to) the choice of publisher, chairmen of any awards, publicity and membership committees. A. KOREAN PHILATELY shall be the official publication of the Society under the authority of the Board of Directors and the direct supervision of the Director of Publications. The Director of Publications shall be the Editor of Korean Philately who may appoint such assistant editors as deemed necessary. Korean Philately shall be published quarterly, in February, May, August and November. Korean Philately shall be distributed without further charge to all members of the Society in good standing. Individual copies of Korean Philately, both current and back issues as available, may be sold to members and non-members at a cost to be established by the Director of Publications. the cost of such publications to members shall be actual production costs, including handling, while that to non-members shall be set by the Director of Publications. C. Manuscripts submitted for and accepted for publications, together with relative illustrations, shall become the property of the Society, and authors shall receive no remuneration for their articles; original documents will be returned to the owner if so requested. D. The Director of Publications shall decide what is suitable for publication under the sponsorship of the Society, or in Korean Philately. the Chapter is guided in it activities by the BY-LAWS of the Society, and by the rules and regulations deemed necessary by the Board of Directors. B. Each Chapter shall report at least once each year to the Society, listing members and activities of the Chapter; the report shall be published in Korean Philately. A. The Board of Directors shall submit to the membership any proposal for amendment or for a revision of these BY-LAWS, which proposal shall have been made by the Board of Directors, a Chapter, or at least five members (other than Honorary Members). B. For an amendment or revision to be adopted it shall be submitted to the membership, in writing, with a ballot provided by the Society for the purpose of voting on the amendment or revision; which ballot is to be returned by mail to the member of the Board of Directors designated for receiving the ballots. Ballots shall be counted at least six weeks, and not more than three months, following the publication of the proposed amendment or revision, and the results published in the next issue of Korean Philately. Ballots shall be preserved for three months against protest. A two-thirds majority of the ballots voted shall prevail. 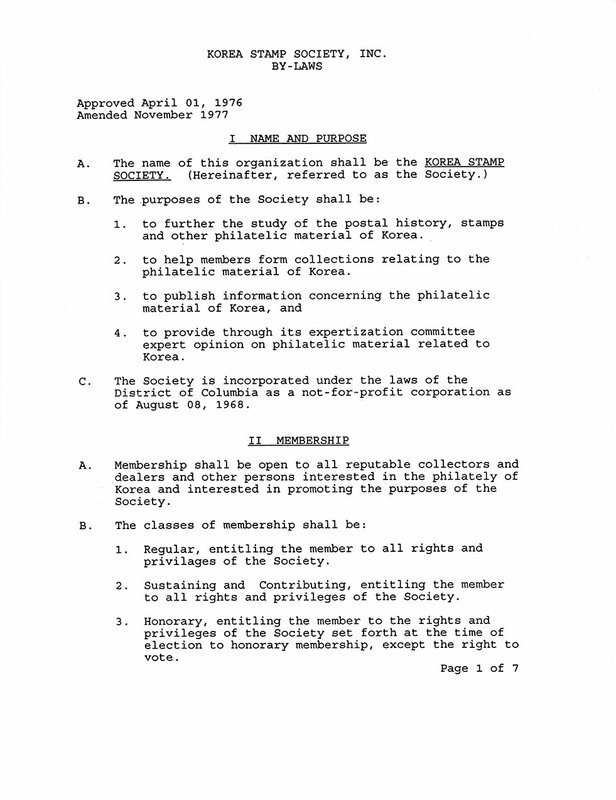 The Society may be terminated, and its assets distributed by decision of the Board of Directors, upon petition by not less than five members, excepting Honorary Members, all in good standing, to the entire membership. A two-thirds majority shall be required for termination of this organization, and upon passage of such a motion, the current Board of Directors will undertake those actions they deem necessary to terminate the Society. A final communication to all members shall list the assets distributed.